The Sound test, also known as the Sound select, is a function built into many video games. Some games feature the sound test as part of the options screen, other have it as an unlockable feature. Still others require a cheat code to activate, as in many Sonic games. Originally meant to test the game's audio functionality, nowadays the Sound Test functions as little more then a jukebox to just listen to a game's music for enjoyment. Sound tests are often put in by game developers to help ensure the audio of the game is working properly, while sometimes they are more polished, anticipating use by the end user. This is evident in the design of many different sound tests. Some are small and feature only a raw list of every audio track in the game by number, while others are more catered to use, such as with the names of audio tracks, as well as a separation between Background music (BGM) and Sound effects (SFX). 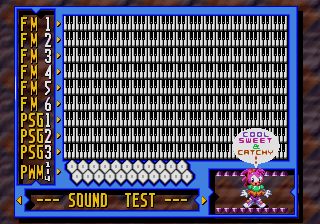 Some games, such as Knuckles' Chaotix, feature extremely complex sound tests, even with their own hidden features, as seen to the right. With the advent of more complex sound systems, the sound test also gave the end user the ability to test different audio modes, such as Monaural (Mono), Stereophonic (Stereo), and later Surround sound, to ensure compatibility. For most the Sonic the Hedgehog series, the sound test has served as a way to unlock cheat modes, particularly in Sonic the Hedgehog 2 and Sonic the Hedgehog 3. Sometimes they are accessible from the start as part of an options screen (such as in Sonic 2), other times a cheat code is required to access the sound test itself (as in Sonic 1).